The researchers, who have published their work in the journal Neural Networks, have studied a brain model consisting of a balanced neuronal network with 80% excitatory synapses (that is, neuronal connections that favor the transmission of information between neurons) and 20% inhibitor synapses (neuronal connections which prevent said information from being transmitted). Interestingly, the initial objective of the UGR scientists was to study how the autistic brain works, for which they intended to develop a mathematical model that would allow the neuronal connections of this disease to be analyzed. However, as their research progressed, they were able to demonstrate, both mathematically and through computer simulations, the existence of a type of state called "spin glass," which corresponds to states of low activity (Down) or high activity (Up). This has been widely described in the cortex of mammals, including the human brain. The so called spin-glass states are magnetic systems that have been extensively described in low temperature disordered magnetic materials and also appear in artificial neural network models. Spin-glass states are frozen disordered spin states due to frustration in the interactions between spins (physical property of subatomic particles, by which every elementary particle carries an intrinsic angular momentum whose value is fixed). Said states can be both ferromagnetic and antiferromagnetic, preventing the system from relaxing to the ground state or causing very long relaxation times. In neuroscience, on the other hand, the spin-glass states manifest themselves by frozen neuronal activity, and they appear (in the absence of thermal fluctuations or noise) due to the interference produced by the memorization of a macroscopic number of memories and the impossibility to discern among so many of them in the memory process. In this paper, the researchers have proven for the first time the constructive role and functionality of a particular type of spin-glass state in neuroscience. 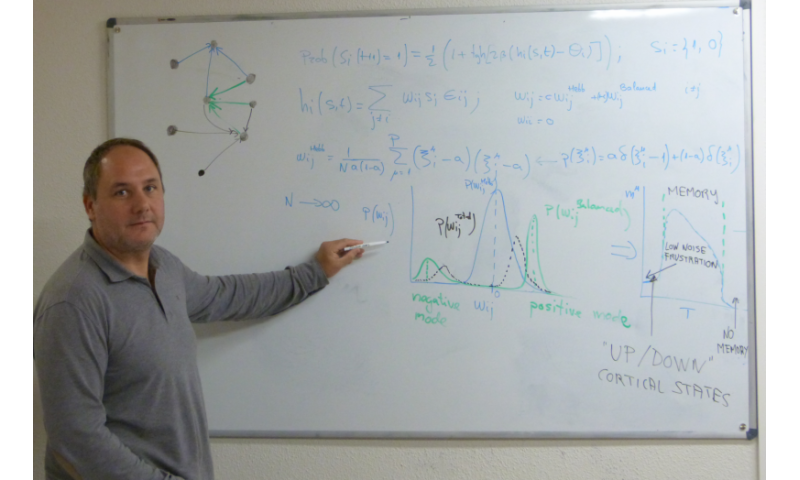 "In fact, we have proven both theoretically and through simulation that the Up and Down states observed in the activity of mammal brains would be but a mere manifestation of these spin-glass states," Joaquín Torres Agudo, professor from the Department of Electromagnetism and Physics of the Matter at the UGR and lead author of the study, explains. This work constitutes an appropriate and novel theoretical framework to study the biological mechanisms of destabilization of these states that can induce transitions between Up and Down states, similar to the transitions commonly described during anesthesia processes or in the transition from wakefulness to sleep.